"We eat first with our eyes" - this quote has struck me deep, ever since I came across it. The fast food / junk food manufacturers have been successfully applying this principle on us through their posters, large banners, drool-worthy advertisements etc. When you see a big hoarding of a burger with dripping mayonnaise and colorful veggies, you automatically salivate. In reality, the burger would be smaller and there would be hardly any veggies. Children start to become fussy eaters when there are alternatives. When we were kids back in the 1970-80s, we ate what was given to us, no complaints or cribbing helped. We didn't have any McD or a supermarket stuffed with Kinder Joy or Lays chips right next door. As parents of today's age, we have an added responsibility (and challenge) to present healthy, home-cooked food in an attractive way so that kids eat without a fuss and not demand junk food for every meal. Here are my 8 tips on how to present healthy, home-cooked foods to your children. 1) Buy a steel plate that has 3-4 compartments. For major meals like lunch or dinner, make sure you have different food items in these compartments. Children love variety. By variety, I'm not saying that you cook many dishes. 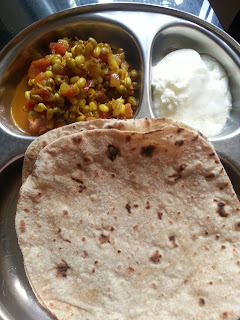 Let's say, the dinner menu is chapati and dal. Apart from these 2 items, add few sticks of cucumbers and carrots. Add a few spoons of curd or a tomato raitha. 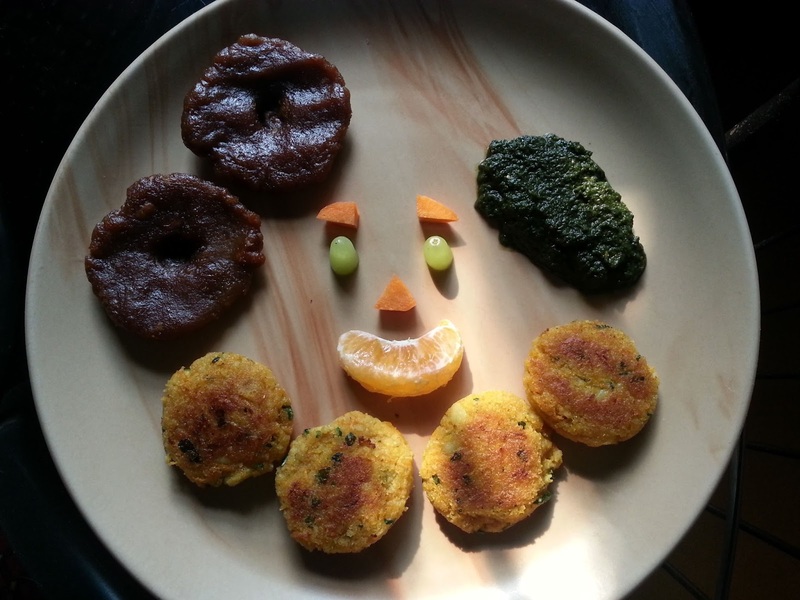 2) Children love colors, so make the plate look colorful. If your main course is say lemon rice which is yellow in color, add cucumbers, color capsicums, tomatoes etc. 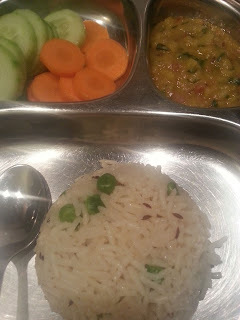 The overall color quotient of the plate goes up and the kids try the veggies too. 3) Play with textures and shapes. My daughter loves raw carrots. So in any meal, I give carrots in one of these forms - sliced in round shapes, cubed, cut into sticks, shredded (big, small) etc. Same strategy applies to cucumber, red radish, cabbage etc. For water melons and musk melons, use a melon baller to cut into round balls. You can also cut a watermelon slice in the shape of a triangle, top it up with some grated cheese and black grapes / olives and serve as a fruit pizza. 4) Take an extra minute and present rice/upma/kichdi in a round shape (fill it in a small cup tightly and flip it over on the plate). 5) Use cookie cutters/moulds and cut chapatis/parathas into desired shapes. It takes some time to cook each individual piece, so try this when you have some time in hand or during weekends. I have a few moulds in the shape of heart, star, hexagon etc. My daughter loves the mini-parathas when I cut into these shapes. 8) Change of place also helps. Arrange a small picnic in your balcony or garden. Spread a mat, bring the food and eat - nothing fancy. "you always have a choice between what is right and what is easy"
Packaged foods are the easy choice - children love them, they don't take much of our time, they are convenient. I admit I have taken the easy choice multiple times. Moms are not robots who can operate at 100% throughput always. But if I'm able to give healthy meals to my child atleast 80% of the time, I feel content and satisfied. Hope you find the above tips helpful. Do share other easy/quick techniques you use to present healthy food in an attractive way to your child. Thank you for your tips. We will try the same for our child.